Jenny Davidson is Executive Director at Stand Up Placer, where she has worked in positions of ever-increasing responsibility for more than 4 years. Under her leadership, Stand Up Placer was recently selected as one of ten agencies in California to serve survivors of human trafficking, along with domestic violence and sexual assault. 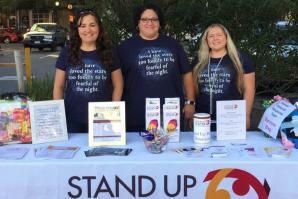 Stand Up Placer has been serving survivors of domestic and sexual violence since 1978. Survivors and the children of domestic violence, sexual assault and human trafficking can find refuge, emergency services and advocacy around the clock in our 55-bed safe house. Victims get to us either by calling our 24/7 crisis line, visiting one of our service centers in Roseville or Auburn, or from law enforcement referrals.